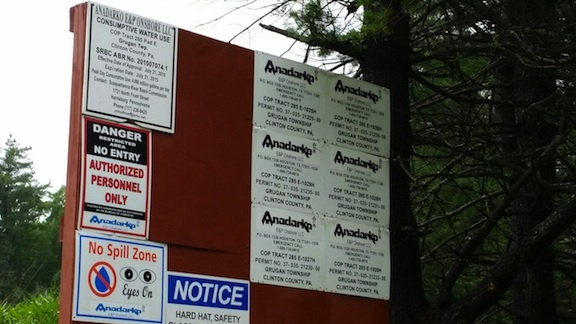 Requiem for Pennsylvania: A frack pad in the middle of a state forest. But in truth, it's just a chunk-o-catastrophe waiting for more. Bitter? You bet, and you should be too. Lest we forget what Pennsylvania has now become--the poster child for a successful and virtually total industrial colonization. Here's your "new" and irreparable (unless you like grass-n-gravel) Tiadaghton State Forest--otherwise known as the "Land of Anadarko"; well, otherwise known as "gone. And these are the happy days. Once (A) the pipelines are built, and (B) TPP begins to take effect, we'll all be nostalgic for the "good old days" before the corporate oligarchy. The saddest part is that we COULD have put up a real fight--some absolutely DID. But I think it's too late now--at least for Pennsylvania. What could have been a genuine movement was co-opted early on--no doubt before I ever realized it in those Halcyon days when I thought--I now realize stupidly--that if people just SAW the pictures I (and many others) were taking--THOUSANDS of pictures of this industrial cancer, they'd be so angry and so galvanized that they'd see through the charlatans looking to use the disaster to bolster (or create) their own careers as pseudo-heros. But, alas, in the face of a culture hell-bent on resignation (to coal and logging), the faux-saviors were easily able to get a foot-hold--convincing people of what had never been true, namely, that the very system that had opened the floodgates to the gassers could be counted on to protect the citizens. So we wasted precious YEARS going through the motions--hearings, FERC, more hearings, industry sponsored events, polite protests on the steps of the Capital Building on a Tuesday at Noon--a few hours of lock-down, some bail here and there. One or two tree sits. you can't make a movement out of following the rules of the very system that's responsible for the liquidation of your lands, your water, and your children's futures. There was never any end to this insanity short of siege after siege after siege of an insurgency whose committed members were willing to be water-canoned, pepper-sprayed, and shot. We were so afraid of being accused of violence that we never seemed to realize that what we had to be willing to do wasn't PERFORM acts of violence--but PERMIT ourselves to be gasser casualties while the world watched. The violence is ALL on the industry's side. We just didn't have the guts to do what was necessary to demonstrate this. Sit down, and not move until they dragged us away by the thousands over and over and over. That, I think, is among the most important insights I have had about the difference between a movement and an insurgency. That the charlatans--and there are entire organizations large and small who merit this description--the Sierra Club, Pennsylvanians Against Fracking, the NRDC, RDA, Clean Water Action, and on and on--could co-opt us into exhausting our time and energy on what could never be other than failures of the efforts of sincere people is, I think, tragic. That they're STILL able to sucker us is shameful. An industry that stands to accrue BILLIONS and BILLIONS more with TPP was never going to do anything but laugh at us until we made them SHOOT us to get out the godamn gas. That is a basic, I think unequivocal, truth. *Below is a letter from my friend and fellow insurgent, Kai Heron, University of Sussex, UK. Firstly, please let me apologise for the unsolicited email. My name is Kai Heron; I’m an anti-fracking activist and PhD researcher based at the University of Sussex, UK. I have recently been awarded funding toresearch the impact of hydraulic fracturing on communities in the US and the UK. As an activist myself, I have a particular interest in resistance to the industry and I have been following the situation in Pennsylvania and NewYork carefully for several years. The Marcellus Shale region’s example has been instrumental to our own struggle with fracking here in the UK. I intend to come to the region for a period of months during my PhD.During my time, I will be looking to conduct interviews with activists and community members, experience the wells first hand, and, I hope, to contribute to the struggle in whatever way I can. The project is intended to be for and by activists, it is therefore really important to me that it makes a difference the communities and individuals I work with. I would also be happy to discuss the project via Skype. Pipeline explosions rattle more than just windows in the same way that nighttime home evacuations result in more than just lost sleep. These are public relations disasters for Williams Pipeline Company – the same firm that wishes to build the 42 inch, high-pressure Atlantic Sunrise pipeline across Pennsylvania. Given recent events here and across the country, how do you justify subjecting citizens and property owners to the involuntary risk of a catastrophic event? If you are editor Sachetti of the PE, you trivialize the opposition position as an emotional “...rush to judgement” as if a technical explanation from Williams will be sufficient assurance that future events will not occur. It also helps if, as editor, you engage in adolescent name-calling and refer to concerned citizens as “greenies” and “anti-energy.” If you are Gregory Markle (PE letter-to-editor 6/16/2015) you employ ad hominem attacks coupled with the standard logical fallacies and false equivalencies that industry apologists have promulgated for decades. Markle, for example, improperly compares the risk of driving a car to living within the blast radius of a pipeline. What he fails to realize is that there is a profound difference between voluntary and involuntary risk. Research into risk tolerance clearly shows that people have a lower risk threshold with respect to allowing the reckless conduct of others to impinge on their safety. Choosing to skydive is fundamentally different from being pushed out of a plane, regardless of the quality of the parachute. While a small number of property owners will receive a financial return on the permanent conversion of their land to a pipeline ROW, Willliams is forcing adjacent property owners who live within the “blast zone” (potentially well over 1,000 feet from the pipeline) to involuntarily submit to catastrophic risk. 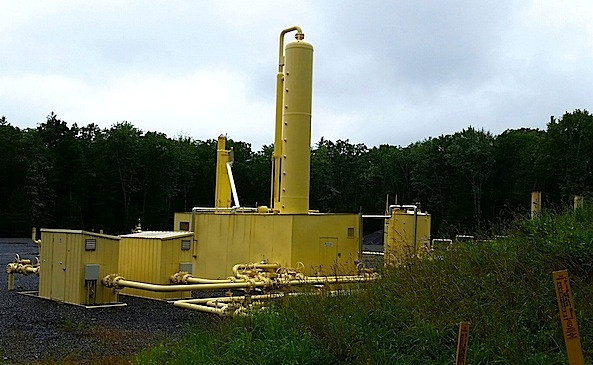 It is also requesting that citizens downwind of any compressor stations involuntarily submit to the chronic risk associated with toxic air emissions. While there is indeed risk in any endeavor, it is inherently absurd to claim that because we assume some risk we should assume all. The effect of additional risk may cause harms to increase exponentially rather than arithmetically. It is also absurd to argue, as editor Sachetti is fond of doing, a false “all or nothing” dichotomy. Opposition to the reckless endangerment of the public health and welfare is not predicated upon living an ascetic existence void of energy consumption. Arguing that people who drive cars or heat their homes and oppose extreme energy extraction are hypocrites is like chastising someone attempting to lose weight for not going on a starvation diet. 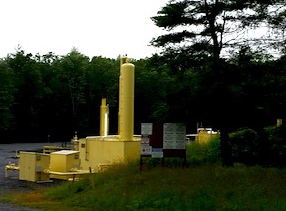 A more intelligent and prudent response to the recent explosion of the Williams Transco pipeline would be to employ the “Precautionary Principle.” Given the severity of the event and the nature of the risk, the burden of proof falls upon Williams Pipeline Corporation to show that catastrophic ruptures and toxic compressor station emissions will not occur. Appeals to existing regulations are insufficient given that the regulations pass involuntary risk onto an unsuspecting public. In the interim, to allow the building of a second pipeline is irresponsible. First, a local gentleman by the name of Gregory Markle went straight for the ad hominems and faulty analogies to try to refute my letter, writing that since, say, living in Tornado Alley is dangerous that living near a pipeline is comparatively safe--so nothing to worry about in William's pipeline explosion near Unityville, PA just last week. What Mr. Markle doesn't get, apparently, is that there's a world of difference between voluntary and involuntary risk. Folks who live in Tornado Alley know that they may be at risk for cyclone activity--they take that on as a voluntary risk. But if, say, you lease YOUR land to Williams, and they build a pipeline that later explodes setting MY house on fire, I have been subjected to an involuntary harm. Indeed, I have been made to subsidize with MY house, MY property values, and potentially MY life and health YOUR voluntary risk. And I have been made to do so involuntarily. There's nothing remotely defensible in THAT. Hence, faulty analogy. Second, Markle claims that my response to the Williams explosion has nothing to do with "concern for human lives," but rather is about "promoting" my "personal politics via fear-mongering." Mr. Markle then says precisely nothing about what these "personal politics" are, but blithely slides right on to falsely report that Williams accident record is just fine since, at least in Pennsylvania no one has died! But, we might ask Mr. Markle, if DEATHS are what's required to become wary of Williams plans to build a monster 42 inch pipeline through far more densely populated regions of Columbia County, then why regulate the company at all? Mr. Markle as much as admits that pipeline inspection is not what it ought to be (and, of course, better to drive Williams out of the state altogether), when he tells us he "won't go deeply into [his] opinion on government inspectors, but let's just say that for every one who actually has the skills to be in the field doing inspections, there are 10 who should be slogging their way up through the ranks." That's pretty cold comfort for safety, yet Mr. Markle would have us put our faith in a company who didn't even know how long the exploding 24 inch, 1000 PSI pipeline had been in the ground. Third, on this point about deaths, Mr. Markle implies that because "there is risk in any such endeavor" we must balance that risk against the benefits of natural gas production. Sounds reasonable--until you realize that what he's really saying is that even though the risks are expected to be borne by people who did not agree to them--for whom they're involuntary--and the benefits accrue to a few already wealthy landowners and, of course, to the tune of billions to Williams, that THAT'S balance enough. But it's clearly not. Indeed, the only "balance" resides in Williams flush bank accounts. All of this dithering with Mr. Markle, however, pales in comparison to the embarrassment that Columbia County, PA commissioners ought to be feeling in the wake of this explosion--one that could have taken the lives of the very people who voted these politicians into office. The photograph below came to me this morning from a friend. I'll let him identify himself should he wish, and I wish to thank him here. 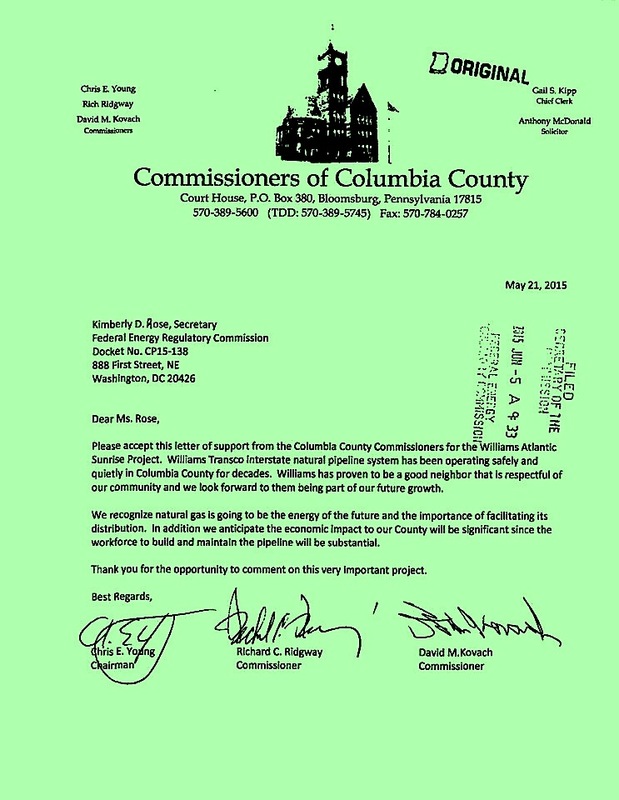 It's a letter dated 5.21.15 from Chris--my support is not unconditional!--Young, silent Richard Ridgeway, and equally silent Dave Kovach, thanking Kimberly Bose of the Federal Energy Regulatory Commission (whose name they misspell as "Rose"(!)) 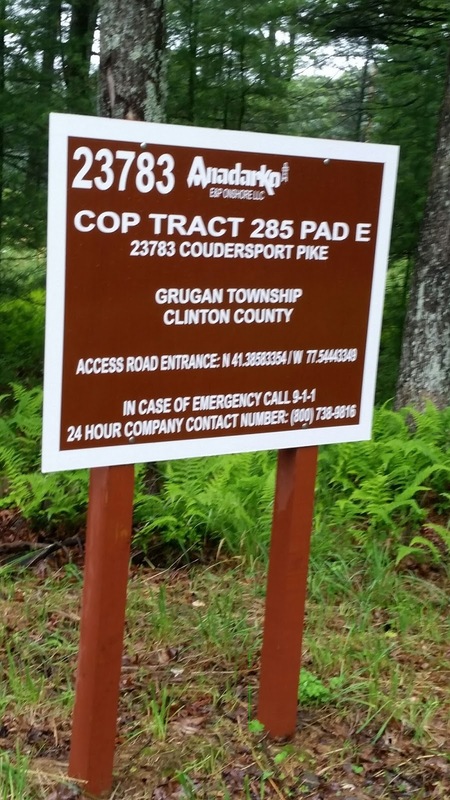 for FERC's support of the 42 inch, 12-1500 PSI monster pipeline set to bi-sect Columbia County. In it they claim that "Williams has been a good neighbor...respectful of our community," and that they're happy for the county to be a part of the future growth of natural gas. In other words, they're happy to be a party to subjugating the citizens of Columbia County to the involuntary risk associated with Williams' profit venture. A last point. Williams will be more than happy to enhance YOUR level of involuntary risk. The moment they execute their "right" to eminent domain against landowners who said NO to that risk, they've not only made you an involuntary--COERCED-- subject of your neighbor's decision to convert their property into a right of way, they've made YOU effectively forfeit your own land, drinking water well, health, and potential life to their profit venture. Eminent domain is intended for projects that clearly perform a PUBLIC good--like a bridge to an island. The gross abuse of eminent domain appropriated by Williams--and endorsed by your elected representatives--is in no fashion whatever a public good. The gas will be shipped to the global markets, and the profits go right into Williams pockets. A last last point: What states have seen LOADS of gas production, pipelining, export? Louisiana and West Virginia--two of the poorest states in the union. So the next time commissioners Young, Ridgeway, or Kovach tell you about how the Atlantic Sunrise is going to benefit you and your county--tell them that if you wanted to live in West Virginia or Louisiana, you'd move there. What if that 24 inch, 1000 PSI Williams TRANSCO transmission pipeline explosion—a blast that fired a “huge boulder” 300 ft., forced evacuation of 60 people, and was heard “miles away”—had been the 42 inch, 1200-1500 PSI Atlantic Sunrise expansion of the TRANSCO Williams wants to build? The one that will intersect a far more populated area throughout Columbia County? What if you were confronted with that second explosion—potentially double that of Tuesday night’s blast that spread debris hundreds of yards into the tops of trees—and asked to evacuate even though it meant leaving your dog? What if you’d need to transport an elderly parent? What if there’d been a fire? What if you’d just happened to be driving, cycling, or walking near the blast zone? Mr. Mordan points out that he’s “glad no one is dead.” Me too, but are we really entitled to let that be the end of this when the disaster that might have happened could have taken life? These are the questions you should direct to commissioner Chris Young who says his support for the Atlantic Sunrise is “not unconditional,” but when queried by concerned citizens demonstrates his support is precisely that: unconditional. Young’s posturing for the sake of protecting his political capital is disingenuous; Kovach’s and Ridgeway’s silence, both staunch cheerleaders for Williams, is equally telling. Williams’ appalling history of regulatory violation, accident, their effort to deflect responsibility and avoid liability is well-documented. Even more reprehensible is the willingness of local agencies and townships to be bribed by the company’s spare pocket change. Orange Township Secretary/Treasurer Erika Burkhardt, for example, recently sent a letter of thanks to Kimberly Bose, Secretary of FERC, the deceptively named Federal Energy Regulatory Commission, for FERC’s support of the Atlantic Sunrise—and the money that will flow from that township’s silence to Kocher Park. Burkhardt writes that “Because of Williams support, Orange Township will be able to improve areas that hold the greatest needs in our community.” What Burkhardt fails to calculate is the prospect that the township’s greatest needs might be a burn unit, an expanded graveyard, or far more voluntary firefighters and expensive equipment. 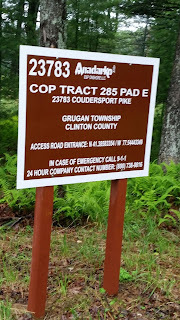 This smug arrogance, however, appears to belong not only to Burkhardt, but to county commissioners, township supervisors, PE Editor Sachetti, Senator Gordner and Representative Mallard. We seem to be lulled by the mantra of “jobs” as if “jobs” had some magical power demanding our wholesale acquiescence. We’re willing to horse-trade the future of the county for a few paychecks, a spattering of royalties, and some absurd hand-waving at “national security” for a pipeline whose golden gas is headed straight for the global markets. Or maybe we’re just that lazy—happy to ignore the hazard at our doorsteps because Wheel of Fortune’s on. Maybe folks think that Tuesday night’s explosion just couldn’t affect them, that the Atlantic Sunrise will somehow be safer, that Williams actually gives a damn about anything but the money they’ll get from mid-streaming the gas the industry is prepared to eek out of the ground at literally any cost—so long as it’s not theirs’. Williams record is clear: they’ll do everything they can to cover this up, avoid investigation, and make sure you don’t know diddly about the causes. They’ll hale local firefighters and reassure us “there’s nothing to see”—until we forget. Until next time. Here’s a question: What will it take for our electeds to decide to care about us? I’m glad no one died, but if that’s what it takes, we’ve acceded to moral bankruptcy. Pick up your phones—starting with Young: 570-389-5608. The Letter below is from Alianza Mexicana contra el Fracking. It expresses solidarity with Denton, Texas in their struggle to protect their communities from invasion by the industrial armies of the Hydraulic Fracking Empire. We, the undersigned organizations, all members of Alianza Mexicana contra el Fracking, express our solidarity with the citizens of Denton, Texas who have taken it upon themselves to resist the highly questionable overturning of their rights to a healthy environment, to clean air and to clean drinking water. 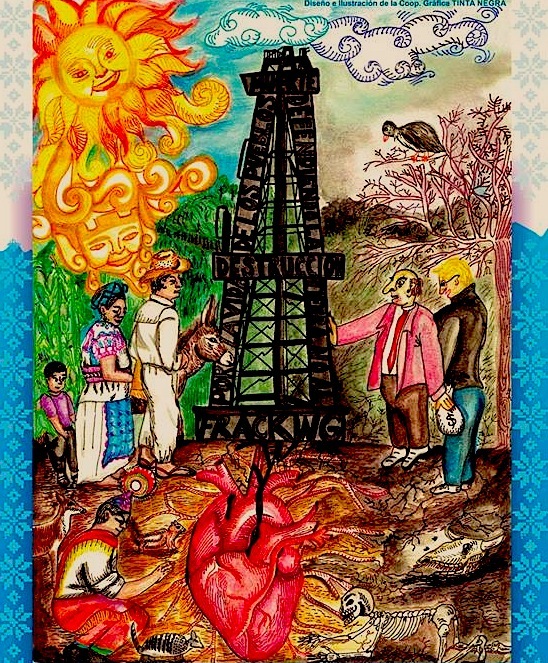 The fact that the majority of Denton´s citizens voted to prohibit fracking in their community in light of the unbearable living conditions it has brought upon them, and that a long-standing legal tradition of municipal rights was summarily overturned by the state´s executive branch is reprehensible. Such an act reflects the degradation of democracy and the imposition of a new, totalitarian order that strives to place corporate profits above human rights and human and environmental health. It demeans “life, liberty and the pursuit of happiness”, the very ideas on which the United States was founded. We support the citizens of Denton and people anywhere on the planet who strive to create a healthier, democratic and more just world for all. ¡No al Fracking! ¡Ni aquí, ni allá! ¡Ni hoy, ni nunca! I met Miss Switch--Switchie-Poo-Pie, as I came to call her-- when she was but a few weeks old. She was the companion-kitty of my son, Lindsay. He had called me in panic because she was desperately ill, limp, and unmoving. Within a matter of minutes, I found myself thinking she was dead in my lap as I drove frantically trying not to look down to the animal hospital. "Tiny, white, fluffy thing," I just kept thinking. "Tiny, white, fluffy thing." "Please don't die in my lap." She was breathing--but barely, and I think many might have decided to let her go once they saw the diagnosis: feline leukemia--a death sentence for cats far and wide. She was so tiny. Possibly a pound; possibly not. After weeks of treatment--intravenous fluids and medicine, shaved legs, and bruised veins--and weight-gain recovery time so that she could stand, Miss Switch lived. A debt of gratitude is owed to some of the most important people on the planet--veterinarians, vet. techs., and some very compassionate veterinary hospital worker-folks. I could not have been more grateful. Miss Switch went home to Lindsay, and for years I saw her just now and again. The trauma of her early kitten life had made her skittish and retiring--the kitty you just don't see, but wish you could. Then one day, about six years ago--Miss Switch came to live with me, five other kitties, six doggies, two parrots, an Amazon Green Iguana, and a cockatiel named "Bird." You'd have thought that this menagerie--really a refuge for the disabled and/or elderly and/or just not that good-lookin' critters in need of a home--would have struck terror into the heart of this tiny ballerina of a kitty cat. And for nearly two years Switch--now, Switchie-Poo-Pie--lived on a shelf in the bathroom with her own bed, her blankie, and her window--gazing at me while I brushed my teeth, got ready for school, thought about my classes. For two years she gazed down at the other five cats--Fiona, Rosie, Madeleine, Tess, and Denver--with wary contemplation. She listened to doggies--Cordy, Charlotte, Jackson, Disney, Mr. Luv-Lyte, and Ella-Mae--with curious, but very guarded, interest barking downstairs, barking out in the yard. She'd tip-toe down in the night to eat and use the kitty box, but by dawn, there she was--in her appointed place on the shelf, as if she were reporting for duty, guarding the bathroom window, making sure errant birds didn't get in. Then one late afternoon, Switchie-Poo-Pie got down. And not only did she get down from the bathroom shelf, she strolled right out onto the stair-landing, and pranced down the stairs to the big-old, beat-up sideboard directly at the bottom. Did she have a brain tumor? Did something befall her shelf-home? No--it seemed that Switchie-Poo-Pie had simply decided that two years in self-seclusion was enough, that there was a world out there to explore, and that it began with a survey of the living room. From that day on, Miss Switch was the undisputed leader of the cat-world in my house. Undaunted by either kitties or doggies, until the middle of last week she was jumping the upstairs gate to the cat-sanctuary room, leaping in ballerina-style from the stairs to the sideboard, going nose to nose smell-check with a relative newcomer to the house--Jenny the Three-Legged Greyhound Wonder Dog, and positively taunting my small-jumping-slightly crazy Maltese Bischon--Mr. Luv-Lyte. And then in the middle of last week, Miss Switchie-Poo-Pie, now thirteen--and having lived far longer than even the most generous of predictions given her rough start--was no longer able to leap the gate, dance on the sideboard daring the dogs, or fly up to her shelf-home. Kidneys, as I have often reported, are the most damnably convincing evidence on the planet that there is no god. Miss Switch had been on a very disciplined regimen for about ten months of injectable kidney-medication, fancy kitty-kidney food, and fancy-canned-kitty-kidney food. But kidneys are like glass slippers--you can walk in them for years, but they're still made of crystal. In any case, the details don't really matter. What does matter is that while she could not ascend to her shelf-home, her other favorite place was next to the bathtub--where she and I played "splash-the-kitty" for years. Here's the game: Switchie-Poo-Pie would glide defiantly up onto the bathtub ledge, and dare me--as if I were Mr. Luv-Lyte--to, well, move. I'd spritz some bath-water in her direction, and she'd skeeter off before it could as much as graze her sparkly fluffy tail. I'd turn to wash my hair, and there she'd be on the bathtub ledge again--as if it were her fashion show cat-walk. 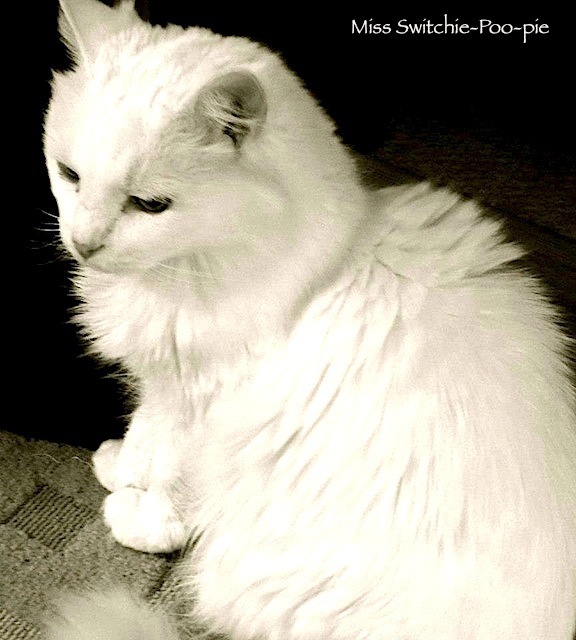 Glassy pale green eyes, fluffy fur white as the first Winter snow, pink nosed elegant aristocratic kitty-ballerina. So, her second favorite place was next to the bathtub. And that's where we arranged her bed early yesterday morning when Switchie-Poo-Pie could no longer stand. I thought back to that tiny pile of white fluff in my lap; only this time, there was no magical veterinarian that could save her. No pain. No suffering. No shortage of kisses. Miss Switch is buried under a lovely maple tree next to Fiona, Rosie, Madeleine, and Mr. Luv-Lizard. She, like they, will become the leaves, the bark, the life of that tree. I could hope for no better for myself. Good night my sparkling elegant kitty-ballerina. PLEASE NOTE: This is a rough translation of the original letter that is written in German. The English version of the letter will not be sent to German Members of Parliament. The Environment Committee of the Federal Council has advocated on 22 April 2015 to prohibit "the breaking of rock under hydraulic pressure for the exploration and production of hydrocarbons". Nevertheless, the federal government wants to essentially hold on to their current bill and allow fracking in Germany. Since Germany is perceived as a leader in protecting the climate and environment worldwide, the German legislation also is a strong signal for other countries. Particularly in countries of the global South, the use of fracking is accompanied by severe environmental and social impacts. We therefore urge you to ban fracking in Germany and to thus send a strong signal in favour of the energy transition - in Germany and worldwide. To still limit global warming to two degrees Celsius, two thirds of the world's known fossil fuels must remain in the soil according to the International Energy Agency. The development of new deposits by Fracking runs counter this target. The fracking boom in the US has led to a sharp decline in oil prices worldwide, thus reducing the incentive to promote climate-friendly alternatives. The poorest countries and population groups suffer most from the consequences of climate change. This holds equally true with regard to fracking: Some of the largest shale reservoirs worldwide are located in developing and emerging countries, often in extremely dry and earthquake-prone regions. The use of fracking does not only directly compete with the supply of drinking water or agricultural irrigation, but can also trigger violent earthquakes. In addition, there are conflicts over the use of land, often with indigenous populations. In Germany, the potential for shale oil and natural gas is relatively low. The exploitation of unconventional deposits in Germany would afford neither a crucial contribution to security of supply, nor would it lead to falling gas prices or significant impulses on employment in this country. The Advisory Council on the Environment therefore concludes that the extraction of shale gas in Germany cannot be justified with energy policy reasons. Given the large environmental, health, climate and development risks, we urge you as a member of the Environment/Economy in the German Parliament to ban fracking in Germany and to thereby send a strong signal for the energy transition - in this country and worldwide.